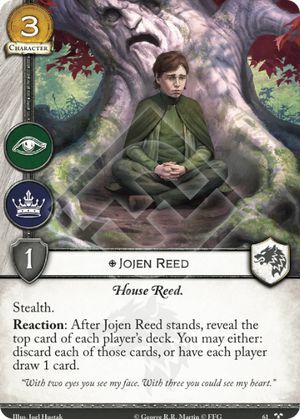 Reaction: After Jojen Reed stands, reveal the top card of each player's deck. You may either: discard each of those cards, or have each player draw 1 card. "With two eyes you see my face. With three you could see my heart." There Is My Claim #61. If you choose to discard the revealed cards, Tywin Lannister (LoСR) can be triggered once for each player.